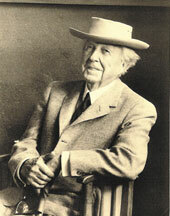 Frank Lloyd Wright is an American icon and a household name in architecture. Ask any American to name one architect, any architect, and chances are, Wright is the name that will come to mind. Like many celebrity professionals, Wright’s personal life was turmoiled, but he is remembered for his stunningly original and practical architecture. With over 1,000 projects to his name, and 500 completed, it is likely that most Americans have seen a Wright home or building, even if they could not afford one … most-cited projects would certainly include the Fallingwater home, with its cascading waterfalls, and New York’s Guggenheim Museum. To me, Wright’s innovative approach to architecture is best encapsulated in his famous personal home Taliesin West, in Scottsdale, Arizona. He used natural local materials, natural lighting and solar heat, and an achitectural style suited, as always, to its environment. Wright was certainly at least 50 years ahead of his profession in designing and building eco-friendly structures.